This is not a drill: Ohioana’s operating support has been eliminated from the state budget, or at least the version passed May 2 in the Ohio House of Representatives. I’m sure you’re as surprised and shocked as we are. Ohioana promotes and celebrates our great state and is one of the nation’s leading literary centers. 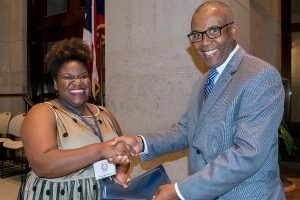 It directly serves 150,000 Ohioans every year and serves ALL Ohioans as the caretaker of our state’s rich literary heritage. Eleven Ohio Governors and 34 consecutive General Assemblies since 1949 have recognized the public value of Ohioana’s work by providing it with operating support. This support is even a part of state law under the Ohio Revised Code. Of course, you already know that Ohioana has value because you love books, reading, and storytelling. 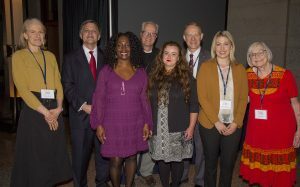 Perhaps you were at the 11th annual Ohioana Book Festival on April 8 in Columbus and you had a chance to meet one of 120 authors and attended a festival panel. 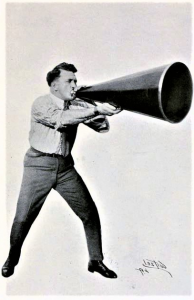 You read the Ohioana Quarterly for book reviews and articles about literary Ohio. Maybe you follow the Ohioana Awards and cheer for your favorite authors when they are nominated. The Ohioana Library Association directly serves 150,000 Ohioans each year. It serves ALL Ohioans as the caretaker of our state’s literary heritage. It costs the state a penny-and-half per Ohioan to support Ohioana. Ohioana generates more than $1 for every $1 provided by the State. Just go to this link and under “Find Your Senator” enter your zip code + 4. Yes, state revenues are tight. Yes, the state has many priorities. But Ohioana’s history proves it has yielded major dividends for a modest investment. Don’t just take our word for it – ask the eleven Ohio Governors and 34 General Assemblies that have supported us since 1949. Ohioana has always worked hard to be a good steward of both public and private money. And we have faced shortages before. But removal from the budget could not just hinder our ability to serve the people. It could, if not halted, ultimately jeopardize our very existence. So please help and make your voice heard – it has never been as important before as it is now! Take a moment and call your state senator before May 10. After all, what is any place without its stories and its storytellers? This year marks Ohioana’s 88th year in operation, and during that time Ohioana has had plenty of time to grow, adapt and, of course, collect literature from Ohio authors. Ohioana’s collection now includes more than 45,000 books, 10,000 pieces of sheet music, and approximately 20,000 biographical files on Ohio writers, musicians, and artists. The best news? Any of these items can be requested to be viewed in our library, by anyone! While this is wonderful for everyone who is able to make it to visit Ohioana’s collection in person in downtown Columbus, some may live too far away or simply may not be able to visit us. However, we think it’s very important to highlight interesting and culturally significant pieces in our collection, and to show them to you even if you can’t make it here to see them. That’s why Ohioana is happy to present our very first virtural exhibit! 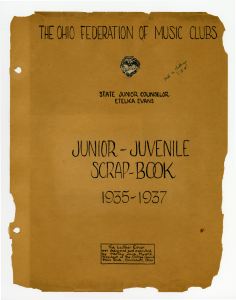 This exhibit features the entirety of a scrapbook from Ohioana’s collection, created by the Junior-Juvenile division of the Ohio Federation of Music Clubs during 1935-1937. The Ohio Federation of Music Clubs (OFMC) is part of the National Federation of Music Clubs, which is dedicated to the love and study of music, and just celebrated their cenntinial year. Click here to visit the OFMC’s Website and learn more about the history of the organization, as well as current events. The scrapbook is composed of 98 pages, with each page decorated by members of music-focused clubs from 30 towns and cities located across Ohio. Pages include articles and programs, as well as photographs, illustrations and handpainted, hand-drawn and handwritten components. 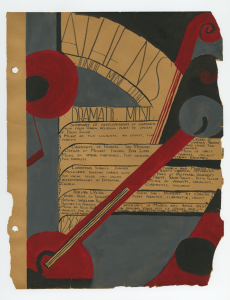 This exhibit includes images of all of the pages of the scrapbook, as well as images of every program and fold-out featured on the individual pages. 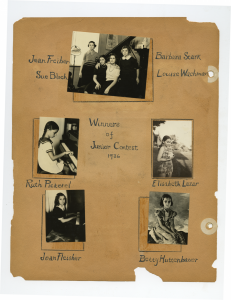 This scrapbook is a proud part of Ohioana’s collection, and we are very happy to have the opportunity to share it with you! Click here to visit it, or navigate from our homepage by clicking on the link under “Resources”. Enjoy, and check back for more virtual exhibits featuring items from Ohioana’s collection in the future!